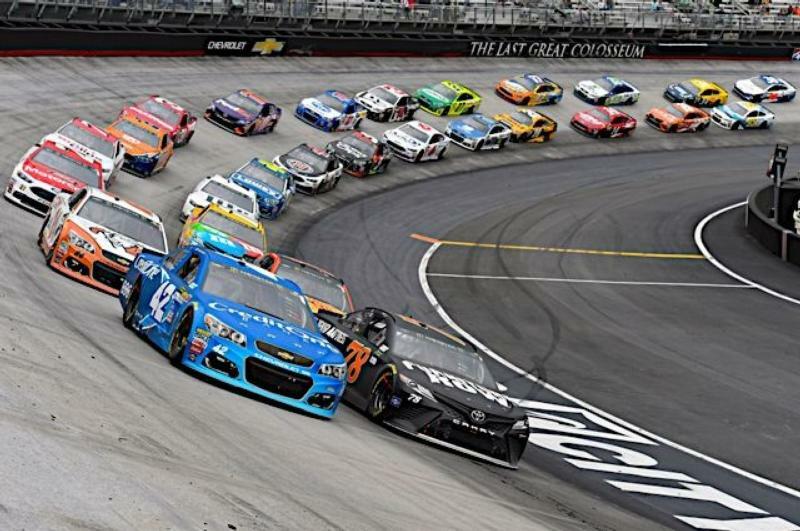 As the beautiful Spring season arrives in the mountains of East Tennessee, guests from all over the country are flocking to one of the great Appalachian traditions: the Food City 500 weekend at Bristol Motor Speedway. The welcoming Tri-Cities region plays host to thousands of race fans who will arrive to witness some of the best short track action in the country. The roar of the engines will echo throughout the famed half-mile as NASCAR's best gladiators battle for bragging rights and Bristol's famed trophy. "There's nothing like the sights and sounds of NASCAR racing and the smells from the campfires and barbecues when friends and families get together at Bristol Motor Speedway," said Jerry Caldwell, executive vice president and general manager of Bristol Motor Speedway. "We're blessed to welcome all the guests who are joining together with a passion for short track racing at its best and encourage fans to arrive early to take in all that there is to see and do around the racetrack and in our region." Driver Introductions: Already one of the favorite pre-race ceremonies of any fans in the sport where drivers walk out to their favorite song, Bristol's driver introduction ceremony has added the fans to the fun. The Speedway introduced a fan vote, giving fans the opportunity to help select their favorite driver's walkout song. There will be a buzz in the air when drivers are introduced at 1:20 p.m.
Musical Entertainment: Race fans will be in for a treat as the likes of A Thousand Horses, The Cleverlys and Joe Everson take to the stage. A Thousand Horses brings their Southern rock/country vibe to the Food City 500 pre-race concert at 12:20 p.m. while the Cleverlys will hit the pre-race stage offering a unique form of entertainment as a bluegrass family band playing modern hits. Social media sensation Joe Everson will perform "God Bless the U.S.A." while painting a red, white and blue picture that will put the crowd in a patriotic mood. Trackside Live/BMS Stage: A fan favorite has returned to the Fan Zone. The Trackside Live stage is a go-to spot for driver appearances, fun family-friendly games and concerts. NASCAR.com will also broadcast a live 1 hour show on the stage on Saturday from 6-7 p.m. and Sunday from 10:30-11:30 a.m. Guests for Saturday include: NBC "Taken" star and Food City 500 honorary pace car driver Clive Standen and Team Penske driver Ryan Blaney, while Sunday's guests include WWE Hall of Famer Goldberg, brothers Austin and Ty Dillon, Team Penske driver Joey Logano and spotter T.J. Majors. Guests are encouraged to stay after the show on Saturday when BMS and NBC will air a special sneak peek of a new episode of the hit show "Taken" guest-starring Blaney. Food City Family Race Night: One of the longest running and most popular fan festivals in NASCAR returns on Friday, April 13 from 4-9 p.m. in Bristol's Hospitality Village outside Turn 4. The free event includes driver appearances, entertainment, free sampling, show cars and much more. For details, visit https://www.foodcity.com/community/events/99/. Return of the Dash 4 Cash: The Fitzgerald Glider Kits 300 NASCAR XFINITY Series race will once again be the first Dash 4 Cash event for the NASCAR XFINITY Series. The new format will take the top four finishing series regulars at Texas Motor Speedway and pit them against each other for the $100,000 prize. In addition, Comcast will donate $10,000 to a local organization that will help promote internet and technology adoption. Enhanced Concessions: In order to enhance the guest experience, BMS has installed new grills and fryers at select concession stands in the concourse. The Speedway is introducing a range of fun new items including the Triple Colossus Bacon burger, Sloppy Joe burger, buffalo chicken and mac-and-cheese over fries and chicken fried steak and gravy over fries. These items will be available at concession stands near Gates 14 and 15 on the frontstretch and near Gate 7 on the backstretch. The two Bush's Beans Trackside Café's on the concourse level will also debut the new Bush's Beans Walking Taco, which features fiesta and steakhouse beans and chili bean chili on Fritos with salsa, cheese, lettuce and sour cream. Kids can get in on the action too with specialty kids menus, located near Gates 7 and 14. A kid's meal includes the choice of mac and cheese or PB&J, fruit snacks or Goldfish, Capri Sun or chocolate milk and a toy. Kids Can Join In The Show: BMS is the perfect place to bring the family as kids can enjoy the whole weekend for only $10! Kids 12-and-under can get in free to Friday's Bush's Beans Pole Day and Saturday's Fitzgerald Glider Kits 300/Zombie Auto 150 doubleheader and can see Sunday's Food City 500 for only $10. All children must have a physical ticket to enter. New for 2018 is the kids In-Race Activity Pack. Families can pick up the packet at any guest service booth located under the grandstands. The activity pack includes a coloring book, activity sheets, stickers and more. Families will want to check out the revamped Bristol Kids Club, located in the Fan Zone near the iconic Bristol tower. The attraction includes a racing simulator, video games, euro bungee, a rock wall, inflatables, face painting and much more. Racing Action: Some of the best drivers in the world hit the high banks at one of the most demanding circuits in racing with action in the Monster Energy NASCAR Cup Series (Food City 500), NASCAR XFINITY Series (Fitzgerald Glider Kits 300) and the NASCAR K&N Series (Zombie Auto 150). Tickets for the Food City 500 are still available, starting at just $70. A two-day weekend package is also available, beginning at just $90. Visit BristolTix.com or call (855) 580-5525. Guests can also purchase single-day Food City 500 tickets for $50 from participating neighborhood Food City stores until Tuesday, April 10.